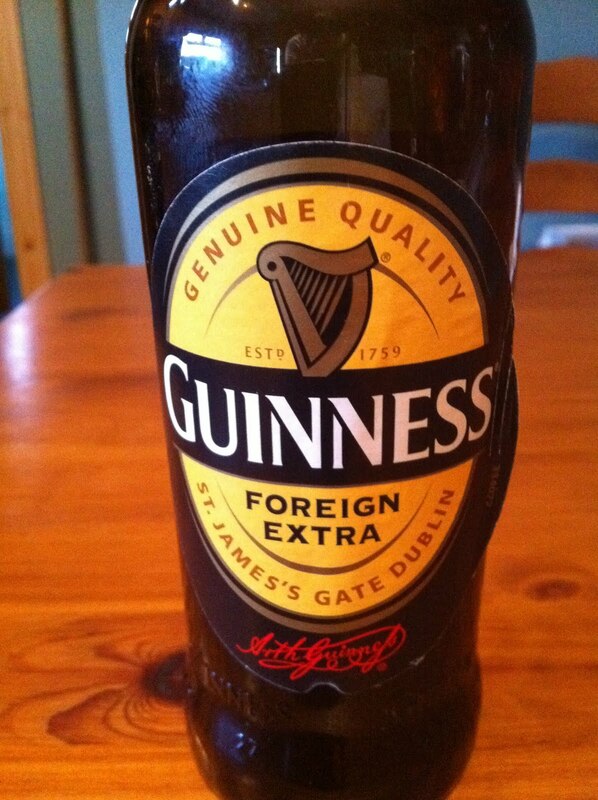 The other day I came across bottled Guinness called 'Foreign Extra Stout' - never heard of it (I am not a lover of stout) but the name intrigued me so I took a bottle home. I always have a glass of Guinness on Arthur's Day and it still takes me ages to drink. I was told that this stout was especially brewed for the African market in past years and that it was suppose to be a lot stronger than the 'normal' Guinness. I put the bottle in the fridge to reach a cooled but not ice cold temperature. Opened the bottle and poured a bit in a glass. Nipped a bit, drank a bit and left the rest. What was the taste like you ask??? Cold bitter coffee - and nope, I didn't like it at all. And this is what Wikipedia has to say about it: 7.5% ABV version sold in Europe, Africa, the Caribbean, Asia, and the United States. The basis is an unfermented but hopped Guinness wort extract shipped from Dublin, which is added to local ingredients and fermented locally. The strength can vary, for example, it is sold at 5% ABV in China, 6.5% ABV in Jamaica and East Africa, 6.8% in Malaysia, 7.5% in the United States, and 8% ABV in Singapore. In Nigeria a proportion of sorghum is used. Foreign Extra Stout is blended with a small amount of intentionally soured beer. It was previously known as West Indies Porter, then Extra Stout and finally Foreign Extra Stout. It was first made available in the UK in 1990. You will have to make up your own mind about this beer - let me know what you think. You can get it in SuperValu at the moment.